Ensaf is proud of her achievements at WorkWell. Photo by Ihsan Ibraheem/Preemptive Love Coalition. When ISIS controlled Mosul, the city was a prison for women who didn’t pledge allegiance to the group. Morality enforcers walked the streets—women deputized to look for other women making any tiny infraction against ISIS’ own interpretation of religious law. If a woman was outside of her home without a very good reason? She received a swift punishment. If a woman was outside without a man in her family accompanying her? Punishment. If a small sliver of wrist was exposed between a woman’s sleeve and her gloves? Punishment. If she dared to wear makeup? Yes, punishment. “During the time of ISIS, women had to stay home. There were no job opportunities.” Ensaf is an ambitious woman, driven to learn. Staying inside the confines of her home for years, with no chance to study, and no opportunity to use her skills—this felt like punishment too. When the city of Mosul was finally liberated after three years, Ensaf made an oath to herself to make the most of her freedom. And she didn’t waste any time! First, she went to her neighbors in west Mosul, to those who had been forced to drop out of school because of the presence of ISIS, and she began a campaign to get them back into school. If they were too traumatized to return to school, or felt like they’d already lost too much time, she volunteered to tutor them in their homes, to make sure they got caught up in their studies. That’s how highly Ensaf views education. Next, Ensaf got the chance to continue her own studies—she heard that WorkWell, our program for helping Syrian refugees and Iraqis affected by war learn tech skills and access the online job market, was opening a campus in Mosul. Despite the fact that Ensaf already had a degree in computer science, there are still so many valuable skills to be developed at WorkWell. “I feel I learned more things here [at WorkWell] than in my specialty in college, because [here] we study the practical and theoretical.” Ensaf’s previous education had left her chock full of theory, but with precious few practical skills in current IT practice and in the online marketplace. Returning to school wasn’t a simple matter for Ensaf—she’s married and has two small children. But she had the constant support of her husband to make it possible. “He encouraged me to keep going and continue my studies…he thinks everyone has the right to learn—men and women.” Ensaf’s husband didn’t just encourage her with words, but he encouraged her with his life. “When I come here [to WorkWell], he stays and takes care of our kids. He creates a good environment for me to study, he keeps encouraging me to study. When he sees me struggle, he encourages me to continue.” Success for Ensaf has been a family affair, and all the hard work and sacrifice has paid off. Ensaf’s new computer and IT skills positioned her perfectly for the workplace. Photo by Ihsan Ibraheem/Preemptive Love Coalition. Last week we visited Ensaf at work. Well, we visited her at one of her workplaces—she actually has two jobs now. 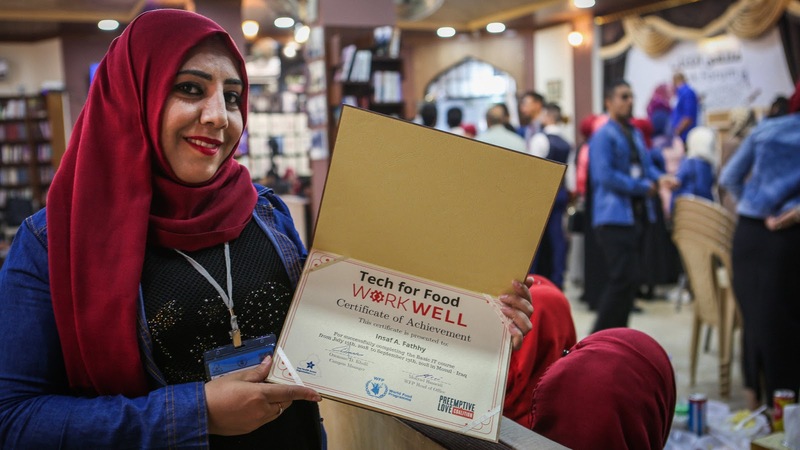 In the city of Mosul, plagued with high unemployment–figured at 56% in dast Mosul, and even higher in west Mosul which suffered more infrastructure damage–Ensaf learned the valuable skills that converted her drive to succeed into employment. During the day, Ensaf works at a rehabilitation center. She has previous experience working in that field, but it was her newly earned computer and bookkeeping skills that gave her the advantage over other applicants. In the evenings, Ensaf works for a local company, again using the computer and bookkeeping skills she learned at WorkWell. The chance to attend WorkWell–to learn computer, IT, and English skills–has changed her life. WorkWell gave Ensaf tools that allow her to stand out from the crowd looking for work in Mosul. And she’s determined to make the most of every opportunity. Last year you provided top-notch opportunities for young Iraqis like Ensaf, impacted by the war with ISIS. You provided them a bridge to the online global marketplace. This year, you can create possibilities for even more young people who need a bridge between the destruction of war and digital opportunity. Help young women like Ensaf build confidence and a new future.